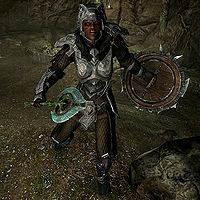 Rochelle the Red is a Redguard bandit who may kidnap your spouse if Hearthfire is installed. She demands a ransom of 5000 gold for your spouse's safe return. You can either pay the ransom, or kill her and the bandits yourself. This page was last modified on 3 May 2014, at 05:45.